Welcome to Hoian ancient town! Located on the northern bank of Thu Bon river, Hoian ancient town is just 2 km2, big enough for you to explore on foot. Hoian ancient town got the seat in UNESCO Cultural Heritage Sites in 1999. Hoi An ancient town is in Hoian city belonging to Quang Nam province. Hoian city is nearly 62 km2 with a population of 92 000 people. Hoian was well-known with the name Faifoo for the businessmen from Japan, China, Middle East, Italy... since 16th century. Before the 2nd century, the Sa Huynh people lived here. The researchers found many daily objects, working tools, jewelry, weapons, glass. All was made from 2000 years to 3000 years ago. Some of them originated from China, Sri Lanka, India, Middle East. Together with wet rice-planting, the Sa Huynh people exchanged the goods with those countries through the small trading port. From 2nd century to 15 century, this land was occupied by the Cham people. The Cham people were rich and powerful with the Champa Kingdom - just 60 km west of Hoian. The evidence of the Cham poeple living here is the Cham wells and one of the most famous food here called Cao Lau must be cooked with the water from the Cham Wells. According to old Chinese books, Hoian Trading port was busy with the ships from China, Japan, Middle East, Italy, India, Portugal... They came here to exchange goods and take fresh water. From 15th century to 19th century, living together with Cham people was the Viet people. And the Champa kingdom got an end to its power in 15th century. The Nguyen Lords came to this land and took over from the Cham people. The important event to make this land more famous was in 16th century, the Nguyen family allowed the Chinese people to live here. The Chinese people who followed the Minh dynasty and fought against the Thanh dysnaty. The Chinese people came from Quảng Đông, Phước Kiến, Hải Nam, Triều Châu, Dương Thương provinces. The Nguyen family needed money to continue the war against the Trinh family in the North, so the Nguyen family could collect the taxes from the Chinese people. Together with Chinese, the Japanese people also came to here to live and did business. Hoian became a famous trading seaport of South East Asia since then to 19 century. In the middle of 19th century, the economic downturn of Hoian happened because of some reasons - the river became shallow, the Nguyen's economy policy and Danang seaport was born by the French. These put an end to Hoian trading port. Hoian lies on the northern bank of romantic Hoai river. Hoian ancient town is a famous tourist destination for both Vietnamese and foriegn travelers. Hoian has many beautiful relics for visitors to explore. One of the most important relics is the Japanese bridge pagoda. 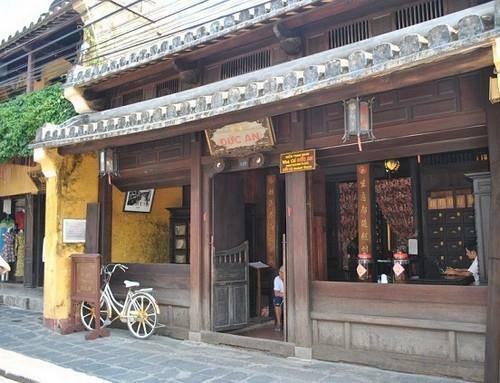 It becomes the example of Hoian ancient town. The local people say coming to Hoian without visit to the Japanese bridge pagoda. It means you have not been to Hoian. Look at it. It is first a bridge over the small canal. The bridge was built by Japanese businessmen and no one know when it was built. It is said that it was built in the 17th century. The bridge was built to link the Japanese shops with Chinese shops. On the north side of the bridge, there is a pagoda. However, there is no buddha to worship inside( Normally when we say pagoda, it means there are buddhas to be worshipped inside, but no buddha here). Inside the pagoda, the Bắc Đế Trấn Võ god - a Chinese god who is beliveved to bring happiness to the local people and prevent the natural disasters to this land. On one side, there is a pair of monkeys to be worshipped and on the other side there is a pair of dogs. It is said that the bridge was built in the year of monkey and finished in the year of dog. It is also said that monkey and dog are the spirit animals to be worshipped in Japan to prevent the natural disasters. According to the legendary, the bridge was built to prevent the sea monster to cause bad effects to Japan. The sea monster has the head in India, the tail in Japan and the back in Hoian. When the sea monster moves the tail, there is an earthquake in Japan. Therefore, the bridge was built to prevent the terrible earthquake in Japan. The Chinese people reached Hoi An in 2ways. The 1st way, they came here to do business with local people. They stayed in Hoian and got married to the local Vietnamese people. The 2nd way, the Chinese groups folllowed their Minh dynasty's generals to fight against the Thanh dysnaty. They were chased by the Thanh dysnaty and came to Hoian. They asked the Nguyen family of Vietnam for stay here. Livinging here, they needed a place to socialize and protect the Chinese traditions for the next generations. They decided to build 5 Assembly Halls in Hoian as they came to Hoian from 5 different parts of China. All of 5 assembly halls are located on Tran Phu Street, facing Thu Bon River. Nowadays, even though not all of the halls stay the same. 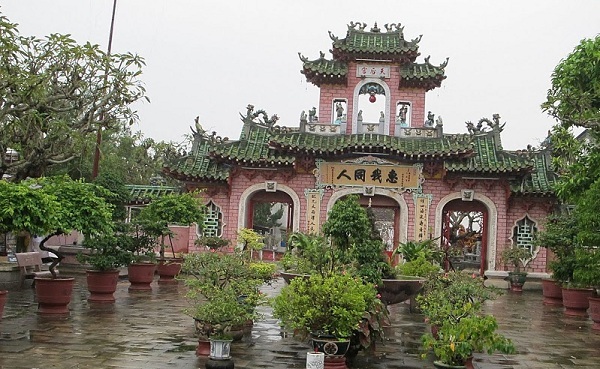 The five halls (Fujian, Chaozhou, Hainan, Cantonese, and Chinese) become famous attractions of Hoi An. Generally, they follow a formula which was used for other Chinese assembly halls in other cities: First is a big gate. Then, a nice garden. Next is a main hall and the last is a large altar room. The decoration for each assembly hall has its own beliefs, different assembly halls worship different gods and goddesses. 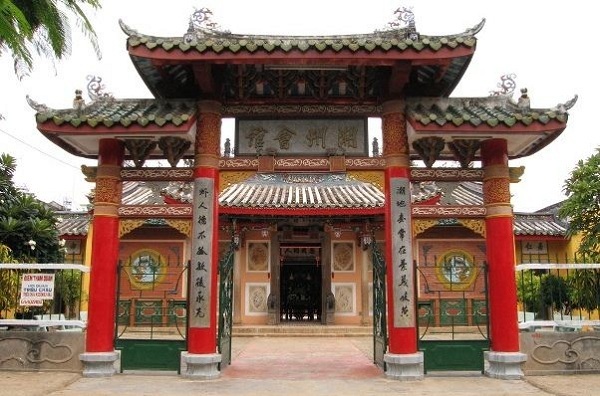 The Fukian Assembly Hall was built in 1697 with a great example of the Chinese architecture. The Chinese merchants of the Fukian Province are believed to build this hall. However, it has been restored several times with some changes. The entrance was rebuilt in 1975. The Fukian people worship the sea goddess Thien Hau who protect Chinese boats in the sea from damage. Thuan Phong Nhi god, who is able to listen to the sound of a ship from thousand miles away. Thien Ly Nhan god is able to see the ships from thousand miles away. The symbols for decoration are fish and 4 sacred animals such as dragon, unicorn, phoenix, turtle. Ngu Bang Assembly Hall was built in 1741. It was then called Duong Thuong Assembly Hall. 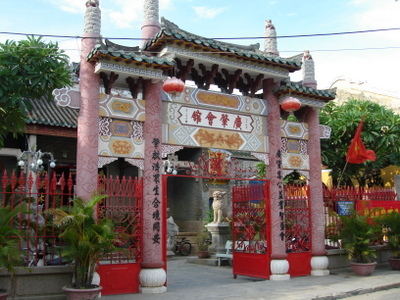 It was the home of Chinese immigrants to Hoian and dedicated to Thien Hau Holy Mother. In 1928, it was renamed Trung Hoa Assembly Hall, then Chinese Public School, and finally Le Nghia School. The house is a place for worshipping and for social meetings. 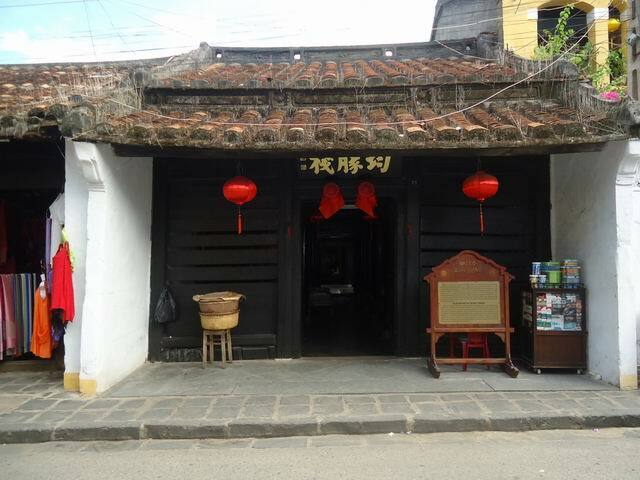 It is also a school for Chinese in Hoi An. Besides Thien Hau Holy Mother, the hall is also dedicated to other people such as Confucius, Sen Yat Jen (a leader of the Chinese revolutionary movement in the early 20th century) and soldiers killed in the anti-Japanese resistance war. The full text of Sen Yat Jen's Testament is found on the wall, in the backyard of the house. This assembly hall was built by Chinese people from Trieu Chau (China) in 1845. It is dedicated to the God of Wind and Big Waves. Those people hope the God will always bring good luck to them and help them travel smoothly on the sea. The people often go here to pray because they think that all their wishes would come true. The most outstanding feature of the hall is a sophisticatedly carved wooden frame, decorative designs, beautiful wooden patterns and embossed patterns made of porcelain pieces. The main hall is dedicated to General Phuc Ba (Bon Dau Quan), a god of mastering waters. The two sides of Phuc Ba's altar are refined for worshipping the Gods of Wealth and Luck. The east-wing house is dedicated to former sages, chiefs and deputy-chiefs of the house. Every year, descendants of the Trieu Chau people gather here from the 1st to the 16th of the first lunar month to worship their ancestors. Quang Dong or Quang Trieu or Cantonese Assembly Hall are different names from the same hall. The hall was built in 1885. The Chinese Cantonese merchants built this hall. The different parts of the hall were separately made in China. Then, they were transferred here and put together to build Quang Trieu (Cantonese) Assembly Hall. The Hall holds an amazing fountain featuring a dragon made of pottery. Besides that, various Cantonese statues are spread out all over the hall. Some of these statues reflect the musical dramas of the Cantonese culture. 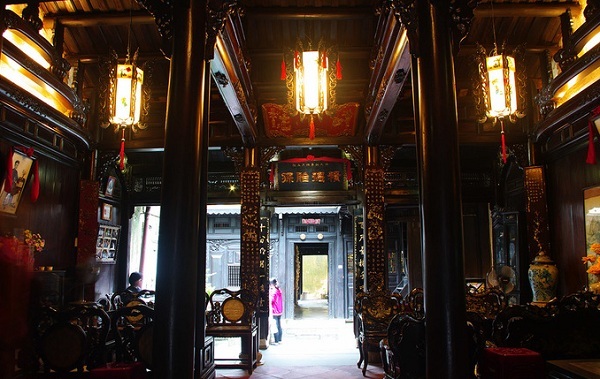 Built in 1851 by the overseas Chinese of Hainan(China) in Hoi An, the hall is used for social meetings and religious activities of Hainan people. This hall is used to worship 108 Chinese merchants who were unjustly killed because they were mistaken for pirates. Later, they were justified and named as deities by King Tu Duc. The king granted the money to build this assembly hall in order to worship them forever. Built in 18th century. Belong to the Le family with 7 generations living here. The front of the house for trading is at Nguyen Thai Hoc street and the back of the house to take the goods from the river is at Bach Dang street. 150 year old house. Chinese architecture. The front of the house for trading is at Tran Phu street and the back of the house at Nguyen Thai Hoc street. 180 year old house with 6 generations living here. The house holds Vietnamese architecture features.